Find A Storybooth & Tell Your Story Today! StoryCorps is a national project to instruct and inspire people to record each others’ stories in sound. A StoryBooth is a small recording booth where you can interview (or be interviewed by) your friends and loved ones. It’s raw. It’s honest. It’s good, clean wholesome fun. It was an idea conceived of soon after the events of September 11th by Dave Isay as a way to give a voice to the “uncelebrated” people — average everyday people like you & me who’ve got something to say. 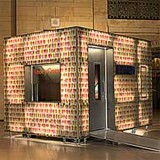 The first StoryBooth was placed inside New York City’s Grand Central Station, in October 2003. The most recent one was placed at the World Trade Center site in 2005. They also have other MobileBooths which travel the country, to enable people to tell their story from their own hometown. It was started as a means of preserving history… an audio history of the lives of everyday people in America. All audio is being preserved and archived by the Library of Congress! Think of it as a time capsule for future generations to enjoy, while at the same time being able to relive your experience through your vivid description of the events as they happened.